The end of 2016 is just around corner, and though it’s exciting to look ahead to the new horizons to be offered in 2017, it’s more prudent to peak at the rear view mirror and appreciate some of the best things that happened to Asian basketball in 2016. Here are, for me at least, the ten most memorable moments/developments in the past twelve months of Asian hoops. As early as 2011, NBA scouts have salivated at the prospect of having young Chinese twin towers Wang Zhelin and Zhou Qi in the Association. Many pegged Wang and Zhou to be the possible heirs apparent to legendary Asian big men Yao Ming and Wang Zhizhi, and one significant step in their journey towards fulfilling that goal was getting drafted this year. Zhou was chosen by the Houston Rockets with the 43rd pick, while Wang was picked by the Memphis Grizzlies at #57. Both were not able to make the final rosters of their respective teams, but they still made history by being the first Chinese players drafted since Yi Jianlian and Sun Yue were chosen in 2007. India's first ever victory over China in 2014 was one of the most memorable moments of that year, and the South Asian squad repeated the feat in the FIBA Asia Challenge 2016, defeating the East Asian powerhouse, 70-64, in the second round. The result served notice that, at their best, the Indians could beat anyone on any given night. It also further underscored the development of the Indian national team’s program, especially with key players Amjyot Singh, Vishesh Bhriguvanshi and Amritpal Singh leading the way. China were a bit of a disappointment in the Rio Olympics, but they continued to be the most dominant Asian force at the young women’s level. China ruled the FIBA Asia U18 Championship for Women 2016, going undefeated in seven outings. Powered by their own version of twin towers - Li Yueru and Han Xu - the Chinese just could not be stopped, and they successfully qualified for the FIBA U19 World Championship for Women 2017. China's U17 women also gave a very good account of themselves at the FIBA U17 World Championships 2016, where finished just shy of the podium at fourth place with 4 wins against 3 losses. The East Asia squad coached by Oh Seil did not go into the FIBA U17 World Championships in Spain with high expectations, but they turned a lot of heads with their speed, shooting, and skill. They had big wins over France, Dominican Republic and China, and that helped them finish among the tournament’s top eight teams. Wily guard Lee JungHyun also made a name for himself by finishing among the top five scorers by dropping 18.9 points per game. Two years ago, Japan were dealt a big blow when they were suspended by FIBA, but they have since made steps to correct their errors, resulting in the new and exciting B.League. Buoyed by an experienced upper management team and an overwhelming spirit of unity among its eighteen clubs, this inaugural season of the B.League has seen rising levels of attendance, sales and exposure for the sport. All this augurs well for Japan, who are hoping to do well in 2017 and looking to play in front of home fans in the 2020 Tokyo Olympics. Iraq have not been in the radar of Asian hoop nuts for quite some time, but they made a big splash this year by, first, doing well in the West Asian Basketball Association 2016 qualifying tournament. After that, they shocked the continent by making it to the top four of the FIBA Asia Challenge 2016 (even beating China in the Quarter-Finals!) and then barging into the Quarter-Finals of the FIBA Asia Champions Cup 2016. These results served notice that Iraq are ready to be more competitive than ever as they try to make even bigger impacts in 2017. As good as countries like China, Japan, Korea and Iraq were in 2016, much of the headlines still revolved around how dominant Iran were. Iran swept the competition in the FIBA Asia Challenge 2016 as they rose to the top for the third straight time. Team Melli went 8-0 at the men’s level tourney and further solidified their claim as arguably Asia’s best national side. At the U18 level, Iran also shone, what with their young men’s team bucking the odds to beat higher ranked teams China, Korea and Japan in succession to annex their third U18 crown at the FIBA Asia U18 Championship. We did not have a FIBA Asia Champions Cup in 2014 and 2015, but the tournament made a triumphant return this year in Chenzhou-Hunan, China. Ten of the most competitive clubs across the continent participated in this joust, which saw perennial Chinese Basketball Association title contender China Kashgar (Xinjiang Flying Tigers) reign supreme. Joining them on the podium were Lebanon’s Al Riyadi and Iran’s Petrochimi. The Champions Cup was very successful, and it should be an annual centerpiece event in the foreseeable future. Of course, one cannot speak of Asian basketball in 2016 without mentioning the FIBA OQT, where three of the best Asian teams took part. Japan went to Belgrade, Serbia for their first ever world level tournament since the FIBA Basketball World Cup 2006 (which they hosted), while Iran travelled to Turin, Italy for their own shot at an Olympic berth. The Philippines, meanwhile, stayed home for the only OQT hosted outside Europe, and they put on quite a show. All three Asian teams went winless in the different OQTs, but their experience going up against some of the very best international teams and players should serve them in good stead as they prepare for a much tougher basketball calendar in 2017. Another East Asian side that really made waves on the world stage were Japan, who impressed mightily in the Women’s Basketball Competition in the Rio Olympics. 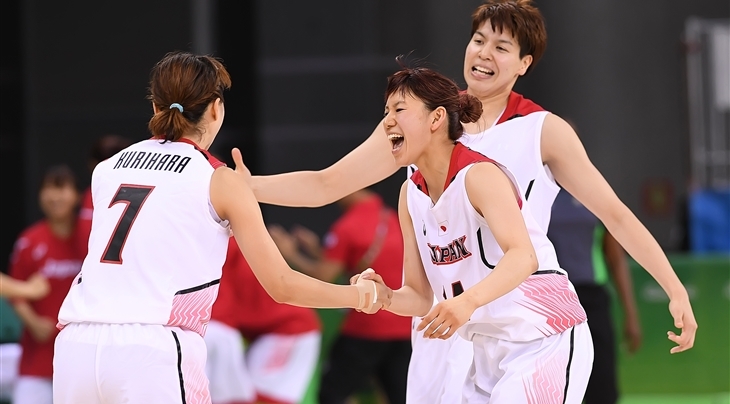 Led by Ramu Tokashiki, the tournament’s third-best scorer, Japan notched big victories over Belarus, Brazil and France en route to making it as far as the Quarter-Finals, where they were eliminated by eventual champions USA. Despite falling short of the top four, Japan could still hold their heads high for putting up a helluva fight all throughout their Olympic campaign. When your dream stage becomes reality. 🏀 🏀 🏀 With the best at the biggest stage. 🏀 🏀 🏀 Thank you for the wonderful time.